We only had 2 days in SF so this was definitely best way to see the city...instead of trying to uber it everywhere. However, they need newer tour guides. And the coordination for the Sausalito tour was a mess - no signs or anything - we waited in the heat for a long time...that tour is not worth it unless you are going to have ample time to spend in the town. We came to explore San Francisco on a condensed schedule, and this worked really well for us. The Alcatraz audio tour was great, flexible to stop and start at our own pace, and deep enough but not overwhelming with information.Our Big Bus Tour guide (Susanne) was excellent. We called the staff at the office at least theee Times with questions before and during our trip, and they always got us answers to resolve any uncertainties or anxietyies about our times, tours, options, and so on. Booked on line from UK, everything was in place when we arrived in San Francisco. Great bus tour and really enjoyed the Alctraz visit. Despite the beautiful landscape of San Francisco, this tour could be better organized, i could visit Salsanito, because there was not enought time for seeingf everything. The information on the online tickets states that we had to pick up our Acatraz tickets a day prior or before 9am on the day of the trip. I drove one hour form Napa to SF a day before to get the tickets to learn that they were not available and that I would need to come back the next day. I was informed by Richard that our Alcatraz trip was at 1:05pm and the last bus tour was at 5pm. 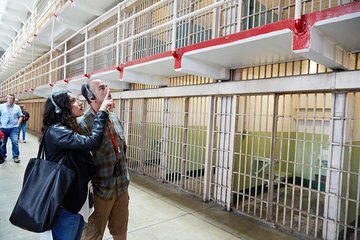 I picked the Alcatraz tickets on the day of the trip without any problems. We had a great time on the island. However, when we arrived at the bus tour office to catch the 5pm tour, we were just informed by an inconsiderate, rude, and impolite manager that the last one left at 4:25pm because it was Christmas Eve. When I told her that Richard had informed us that the last tour was at 5pm, she just told me that I was misinformed and that I could write an email to complaint if I wanted to. So we ended up paying $110 dollars for an Alcatraz ticket that only costs $38.00. Extremely disappointed with the company, specialty with the lack of professionalism of the lady who rudely assisted us on 12/24/18. Faultless from start to finish - great way to see SF and Alcatraz - staff very helpful and friendly - you must do this ! Excellent tour, lots to see. Great explanations of the city history by the guide. Would spend more time at some stops. We arrived 11/10/18 and the staff person who helped us retrieve our passes that we had purchased online was very helpful. She informed us of things we did not know about the tour, and the best way to utilize it. We were immediately able to get on the bus and start touring the city. Although I had been to SF many times before, I still learned some new things with the different guides we had! We had a great guide on the trolley , at about 3 p.m., into Saaaauuussssaaalliiitttooooo (Sausalito - but that is how he said it to make it fun!) Anyway, he was a great guide we just wish we would have gone there sooner. Cute little town to return to for sure! Our night tour with Alexis was GREAT! She was a great guide, and gave us a lot of great information along the way. During the day, some of the guides were so-so, and some we just unplugged the headphones, because they just liked hearing themselves talk. Anyway, for the most part it was the best way to see the most you could in the short amount of time we were there in SF! Alcatraz tour was great, just wish you could get much earlier times, so you didn't have to break up your day so much. I really just wanted to the Alcatraz tour but it was sold out so I did the big bus tour also and it turned out to be a great time. It was a beautiful day in San Francisco so we sat on the top in the sun where we could see everything. I have a recommend this for everyone. Give yourself three hours for the bus tour.